The stethoscope revolutionised medicine, but it also provoked anxieties about the unfamiliar sounds it revealed. 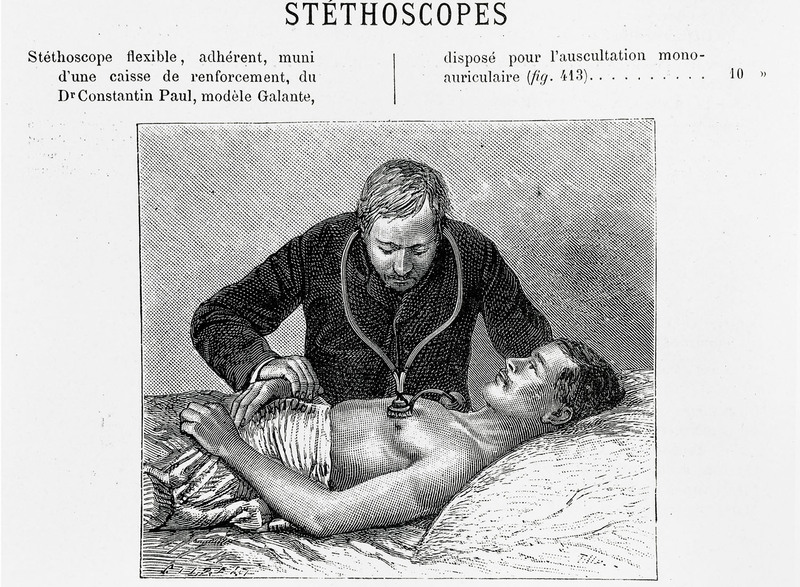 René Laënnec’s invention of the stethoscope in the Hôpital Necker in Paris in 1816 heralded a new era in clinical diagnosis. Through a long and painstaking process of describing and matching the sounds he detected during his assessment of patients with the physical changes within the body observed during autopsies, Laënnec developed a new way of knowing, understanding and diagnosing the human body through the medium of sound. Through his simple wooden tube, the body’s inner pulses, buzzes, hisses and vibrations became scientifically meaningful signs of definite, pathological conditions and in 1819 he published a 900-page treatise on the stethoscopic art. In its gradual adoption by medical practitioners across Europe and America, the stethoscope emerged as a potent symbol of modern medical practice and the authority of the physician. It also marked, as the historian of science and technology Jonathan Sterne has observed, an important shift in the western history of listening, whereby the voice and the inherently subjective account supplied by the patient to the doctor were no longer the primary basis of diagnosis. They now existed alongside numerous other sounds made by and within the patient’s body. In effect, patients could now let their bodies do the talking, as physicians devoted their attention to deciphering the cacophonous realms of the human body.